… how to build blogging habits. There is currently an offer on The Online Growth Masterclass – if you are ready to build your online marketing habits, there is no better way to start. Check out The Online Growth Masterclass here. Below you can find the full transcript for this episode of Marketing in Minutes. Why does a blogger become successful? The truth is bloggers become successful because of persistence – and not necessarily talent. I’m Jonathan Gebauer and today, let’s talk about why you need to create habits to succeed as a blogger – and how to do that! What does a blogger need to succeed? If you are new to this, your answer is probably going to be: Skills as a writer. But the truth is, that’s not what it takes. Creativity can be learned along the way – at least the sort of creativity you need as a blogger. Writing good blog content can be learned. What you really need is persistence and the only way to be persistent enough to succeed as a blogger is to create habits. And that’s easier then you think. 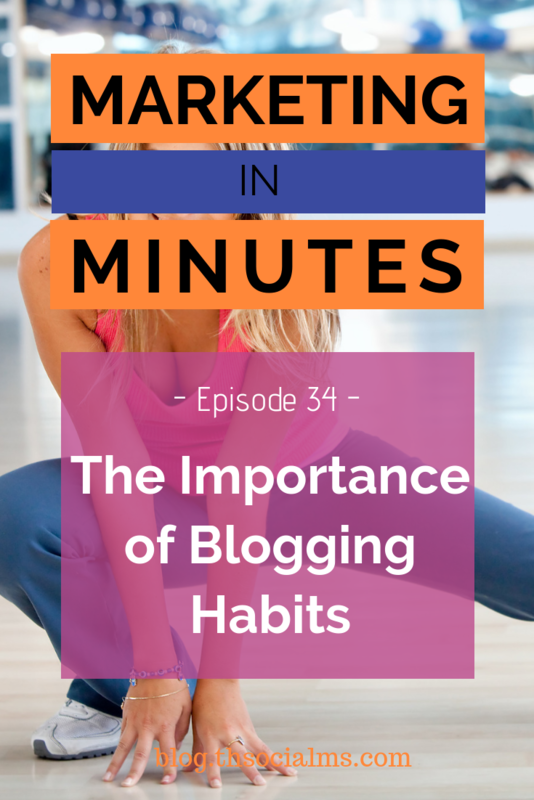 Let’s start by comparing blogging to personal fitness… And if you don’t get anything else out of this episode, you will at least learn about a way to become fit without feeling like you will never make it. I go to the gym three times a week. It’s a habit. I also ran two marathons, and did various others sports in my past. But there were times when I wasn’t very fit. I was overworked and didn’t care much about my health. And when you are not fit, starting to do any sport to improve yourself is something you tend to put on hold. Not because you don’t have the time, but because going to the gym and returning sweaty and with your body aching doesn’t look like a lot of fun. I guess many of you know the feeling. And even when you start, the chances are high that you are going to stop again very soon. A while ago I discovered the answer to my problem – in a Youtube video. Some random fitness guru showed me a better way to improve myself. A way that wouldn’t make training a pain. And it’s really easy – and believe me, it works. You won’t even need a gym membership. You do it by creating small habits. So instead of starting by going to the gym every day for 2 hours (and giving up after 2 or 3 days), you could start by reserving 5 minutes every day. And you don’t even need to train at first. Instead, you start by sitting down on the floor for these five minutes and simply relax. Do this every day for a week. Sitting down for these five minutes will become a habit. The next week, you will add a single exercise that you do in these five minutes. Nothing terribly painful, just a single exercise that doesn’t force you to do anything that will use up all your strength. The week after reserve 10 minutes, you could add another exercise or just do the same exercise for 5 minutes and sit down for 5 minutes. You are making a habit out of exercising every day. You won’t sweat too much – and after just a couple of weeks you will have made a habit out of exercising. And instead of having to force yourself to do it, it will become hard to stop. It’s the same with doing anything in online marketing. If you want to be persistent you need to create your habits. And you need to be persistent if you want to be successful. Discovering how to build habits totally changed my life. It changed how I approach my job, it changed how I learn new skills, and it changed how I approach my health. For many people this might not be as important – but for online marketers and specifically bloggers, it is. Here is how I suggest you use this knowledge to build your success with blogging. And if you’re thinking about stopping to listen right now because you have already started – don’t. The following applies to you just as much. I’ve seen too many people start a blog and dive right in – writing blog posts every day, trying to do everything at once, overworking themselves and then stopping. When you do that, you are not enjoying what you are doing – and you will probably give up soon! When you are running a blog and want to be or are a professional blogger, one of the most important things is having goals you want to reach. But it’s equally important that you make these goals small: Like starting your blog, writing a specific number of posts, getting traffic, or making your first Dollar. All of these are goals – and for each of these, you have to invest work. So what I suggest you do is approach each goal just like personal fitness: Reserve some time. 5 minutes, or 10, every day. Start with reading up on how to achieve this goal. And then slowly extend this time. Start implementing some of the things you read about. Do some thinking. Create habits. If you do that, everything will begin to fall into place. This is, of course not a guarantee of success – but at least you won’t fail because you become completely exhausted. Online Marketing coaches and influencers like me can help you with everything else in your blogging journey, but you have to get this part right – or you are in for a very tough time. But if you follow this advice, you will make blogging a valuable part of your life – a part that you don’t ever want to miss again. I hope you enjoyed this episode of Marketing in Minutes – and if you decide that blogging isn’t for you, maybe I can at least be your motivation to work on your fitness. Anyway – if you like the show, please subscribe, and maybe share a review on Apple podcasts. Oh, and if you are ready to build your habits – there is currently a special offer for The Online Growth Masterclass. You can check it out in the show notes as well! That’s it for today, take care – bye!